Street tacos layered with pulled pork carnitas, crunchy cabbage, red onion, cheese, and cilantro make an awesome dinner any night of the week. My family gives these tacos ten thumbs up every time we make them. One night while we were hanging out at the house, my friend Sandra made these street tacos for us. The tacos are so simple, and yet, they taste amazing. Don’t skip that squeeze of lime on each taco, it absolutely makes them! Warm the tortillas in a hot skillet or in the microwave. Layer the meat, cabbage, and onion on the tortillas. Sprinkle with cheese and cilantro. Squeeze a wedge of lime over each taco and serve with sour cream and additional lime wedges on the side, if desired. Enjoy! 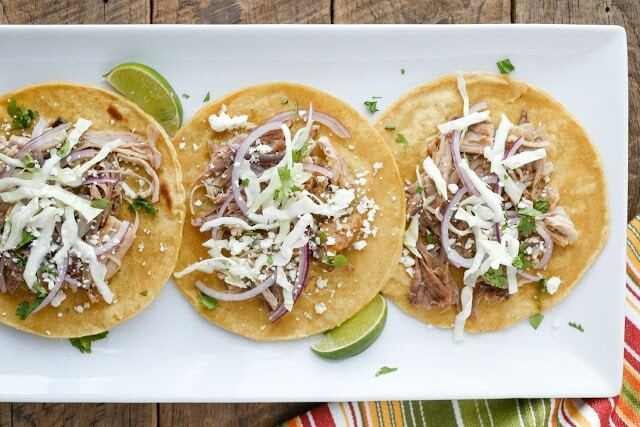 You won't need a full recipe of carnitas in order to make these tacos. 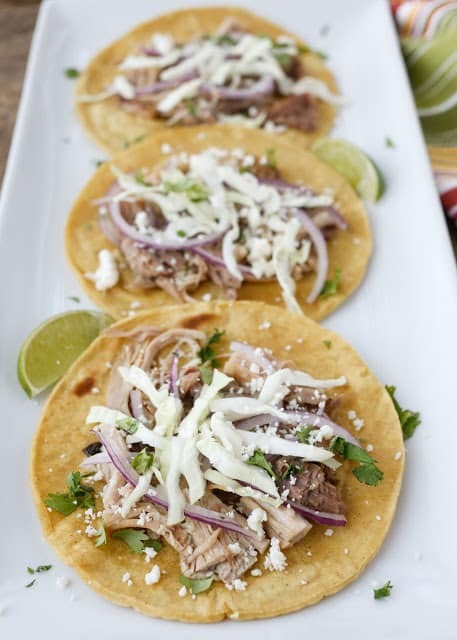 You'll need approximately 3 cups worth of cooked carnitas for every dozen or so tacos. Feta cheese can be substituted for the cotija, if that is easier or your preference. Yum - these look wonderful, Mary. I love Pork Carnitas and almost always order them when I am out for Mexican food. I also always top my taco off with a squeeze of lime. Delicious! Those street tacos look divine! 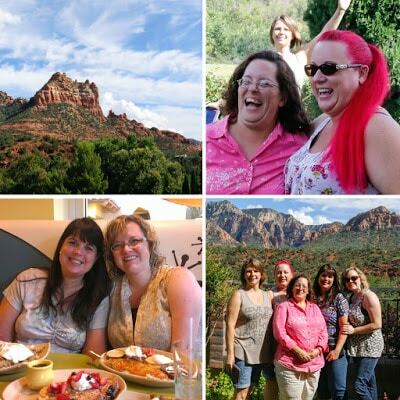 That group of gals seem amazing and fun too! Hi Mary, your street tacos look delicious, how wonderful to be able to spend some time with friends. These look like the best tacos ever! 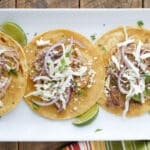 Great looking tacos, we love carnitas but don't make them often enough. Our family is Mexican and I will give you tips on how we prepare our carnitas in the traditional way. I pressure cook it without any spices or herbs. We like the taste of pork (we never use pork loin) and don't want to mask it. Once the pork is cooked and can be pulled, we put it on a cookie sheet and stick it under a broiler for it to crisp up. Also, a large dry skillet will achieve the same results and a little faster. We make a pico de gallo from chopped seeded tomatoes, the green part of green onions and two bunches of chopped fresh cilantro. Do not add sugar or salt as it will make your pico de gallo watery and tasteless and will last in your fridge longer if you don't. Serve with lime wedges. We always use fried or steamed corn tortillas for carnitas tacos and we never use cheese (does not mix well with pork or lime wedges), lettuce, or cabbage. If you feel you must use cheese (not traditional), the best for this would be queso fresco, a fresh cheese crumbled on top (not melted).